U.S. 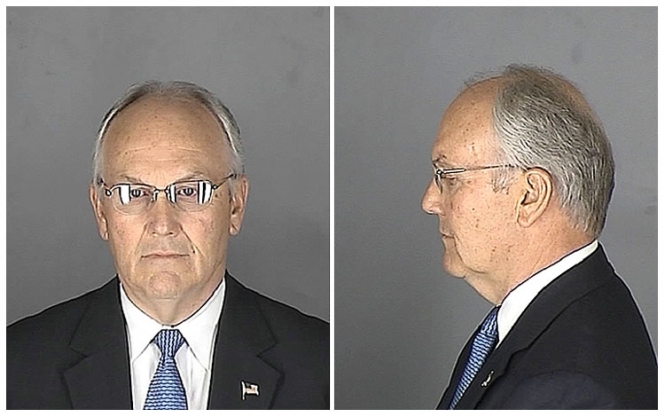 Senator Larry Craig was arrested in June 2007 in a men's restroom at the Minneapolis-St. Paul International Airport after he apparently sought some same-stall action from a plainclothes cop. According to airport police, the three-term Idaho Republican appeared versed in the subtle signs of seeking a stall assignation, from under-the-divider hand motions to some furtive footsie. For his part, Craig denies engaging in lewd conduct and contends that the plainclothes officer misconstrued his actions. Craig, 62, pleaded to a misdemeanor disorderly conduct charge in August and was fined $1000 and sentenced to ten days in the Hennepin County lockup (though the jail time was stayed as long as the politician keeps clean for a year). Submitted by clairpie on Tue, 2011-03-15 15:12. Yep another Republican. And I bet he was against gay rights. What a pig. Submitted by mel on Sat, 2010-08-07 21:00.